What makes us at Enclave Dental very special is Dr. Thomas’ natural, holistic approach, which seeks to always treat the underlying problem causing the symptoms and eliminate the real cause, rather than covering up the symptom. This also means she takes great care to use products and restorations which are METAL FREE and BIOCOMPATIBLE. Our office is not simply Mercury Free, it is Mercury Safe. We go the extra mile to make sure our patients and staff are kept safe from the toxic air and materials. Our goal for every patient is to achieve whole body health, rather than just treating symptoms as they appear. In Dr. Thomas’ own words, “What I do for my family, I do for my patients.” As a mother of three who does not expose her children to fluoride, she follows the same standard in her office, and does not expose her patients to fluoride. She is proud to offer her patients complete and wholesome care in a comfortable, spa-like environment and wants everyone to SEE AND FEEL the difference in natural, holistic dental care! Dr. Preetha Thomas received her DMD Degree from the Advanced Standing Program at Harvard School of Dental Medicine in Boston. Her clinical training includes rotations in the Maxillofacial Oral Surgery Department at Massachusetts General Hospital and at Boston Children's Hospital. She has completed advanced training in oral pathology at Brigham and Women's Hospital. 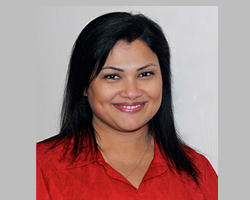 Before her education in the U.S., Dr. Thomas obtained her Bachelor of Dental Surgery (BDS) and later her Masters in Orthodontics and Dentofacial Orthopedics (MDS) in India. She has lived in Massachusetts with her family for over ten years. During her career here she has worked both in public and private sectors. She was the Dental Director at the Holyoke and Chicopee Health Centers for several years. She worked as Clinical Instructor in the Department of Restorative Dentistry and Biomaterial Sciences at Harvard, Tufts and Boston Schools of Dental Medicine. She also held the position of Consultant Faculty with the Lutheran Medical Center in New York and for the AEGD Residency Program at the Holyoke and Chicopee Health Centers. During her time at Harvard she was actively involved in providing oral health screening and education for homeless adults in Boston. Dr. Thomas was an Associate dentist to Dr. Binca Warren and later Dr.Teddi Olszewski at Northampton Family and Cosmetic Dentists in Massachusetts. In 2013, Dr. Thomas moved to Keller, Texas. She worked alongside Dr. Stacy Cole at Clear Fork Healthy Dental. Her passion for dentistry and her curiosity for biologic dental care took her to the next level that she was striving for. Dr. Thomas is looking forward to bringing her experience in private, public and academic settings to her office at Enclave Dental. Over the past years of her career, she has completed hours of continuing education credits. She believes in keeping herself updated in her field so that she can provide the best service to her patients who entrust their care to her. She has finished 200 hours of CE with Garetty Orthodontics. She has taken hands on courses with Dr. Gordon Christenson. She is a pre-fellow and is working towards her fellowship in AGD. She is an active member of AACP, ADA, TDA and the Fort Worth District dental society. She is also a member of IAOMT and follows their protocol for safe mercury removal. Our office is mercury free and mercury safe!